Parking garage with 5 decks. 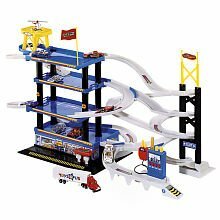 Set includes 8 die-cast cars, 1 truck and 1 helicopter. Moving parts, tracks and petrol station.